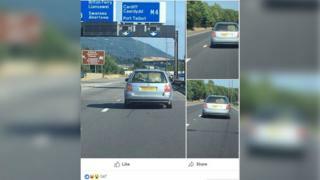 A motorist who appears to have transported a live cow in the boot of a car while travelling on a motorway in South Wales has been found by police. Officers began investigating when the unfortunate bovine was spotted in the back of a Volkswagen Passat on the M4 near Briton Ferry on 6 June. Photos of the car were shared widely on social media and the RSPCA animal charity expressed concern at the image. Police said the driver had since been spoken to and inquiries were ongoing. South Wales Police said detectives were looking at whether any road traffic or animal welfare offences had occurred, but added that it would not comment further on the investigation - amid online speculation about why the cow or calf was in the estate car at all. Transporting an animal in the back of a car is not illegal in its own right. Rule 58 of the Highway Code states that animals must be "suitably restrained" so they do not distract the driver or injure the driver, or themselves, if the the vehicle suddenly stops. However, penalties for overloading a car include fines of up to £300 as well as three penalty points.